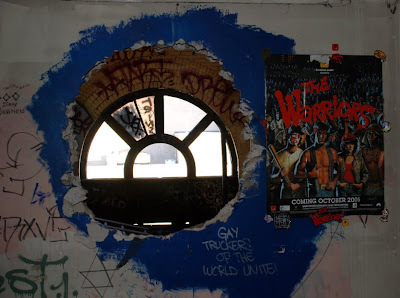 The Batcave once housed a massive squatter community on the banks of the Gowanus Canal. 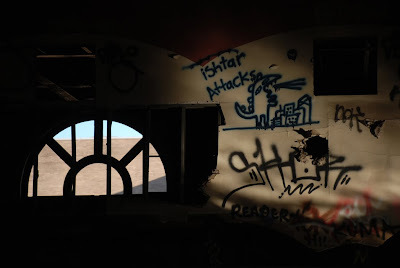 Situated inside a long-abandoned power plant, the squat was allegedly organized around a "communal way of life" with a "bike shop" and "rules about hard drugs and detrimental illegal activity." 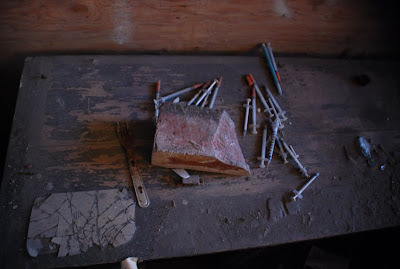 By 2006, however, the NY Daily News reported that the community had devolved into "a decadent drug culture consumed with vicious fighting" including "mainlined heroin" and "a homeless man... thrown from a window." 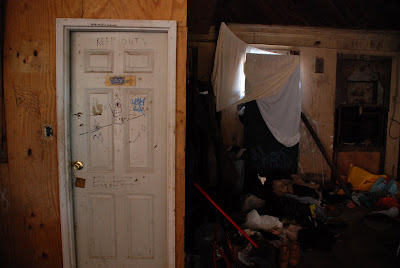 In response to this lurid article, the building owners evicted the Batcave squatters and then "sealed the place off and posted a guard," according to Curbed. Ironically, the owners of The Batcave had dreams to create their own community on the property, to be called The Gowanus Village. Revealed in 2004, their initial designs for this luxury housing development imagined "350 condominium and rental units... on a more than two-acre site," according to The Brooklyn Paper. The NY Times described it as "a collection of loft buildings and townhouses on the east bank of the canal." The Gowanus Village was just one of several large-scale housing developments planned in the neighborhood during the last decade. Other proposals included the Toll Brothers development, the Public Place project, and a Whole Foods Market to be located in a brownfield across the street from the Batcave. Like much of the Gowanus Canal area, the land underneath the proposed Gowanus Village was considered extremely toxic. 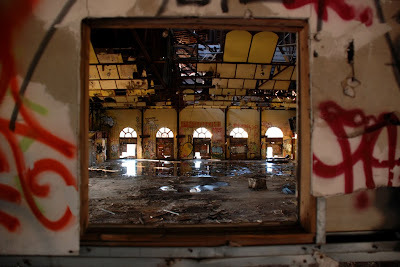 The property is officially designated as a brownfield, and in the past "included uses like a sulphur works and coal-fired power station, a paper mill, lumber yard, garage with gasoline storage tanks, an iron junk yard and auto repair shop," according to the Brooklyn Daily Eagle. The Batcave building itself was once the Central Power Station of the Brooklyn Rapid Transit Company (BRT). Dating back to at least 1896, this coal fired power plant was "capable of moving 125 tons of coal per hour" which was used to power "the engine and dynamo room," according to Electric Power Plants by Thomas Edward Murray. "The Engine and Dynamo Room"
An initial visit to this empty powerhouse in 2007 revealed a surprisingly unique interior, with huge industrial halls dominated by hundreds of graffiti pieces. 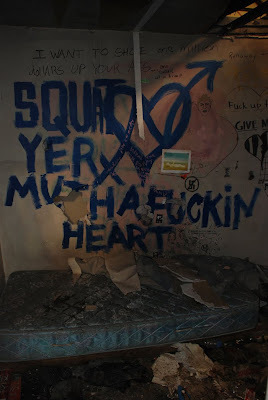 Many of the squatters' rooms remained intact, with beds, posters, prescriptions and needles left behind as evidence of a rushed eviction. 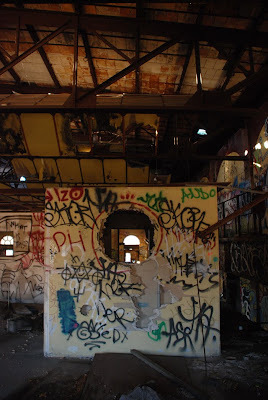 This evocative space was soon featured in an award-winning film about a Brooklyn squatter, "Cave Flower" (2008) directed by Sam Fleischner. 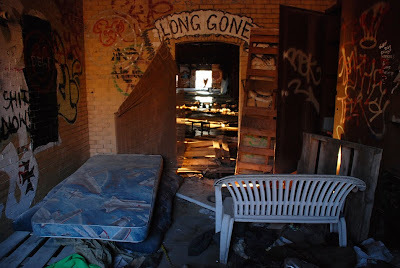 A second visit to the Batcave in 2010 revealed further natural decay. 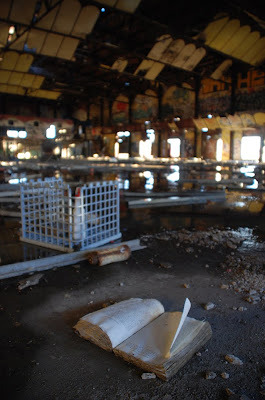 Additional holes in the slowly collapsing roof flood water into the building. Mold and rust have overtaken many surfaces. 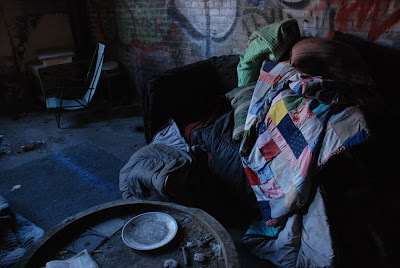 Like a tomb, the empty building still contains many squatters' belongings trapped inside. 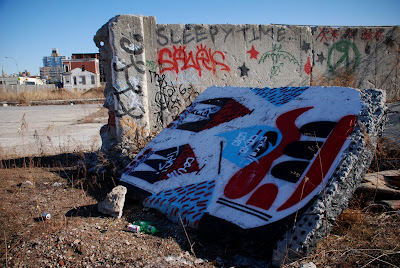 The recent plans to build a new community on the banks of the toxic Gowanus Canal now seem to be part of a faded dream. 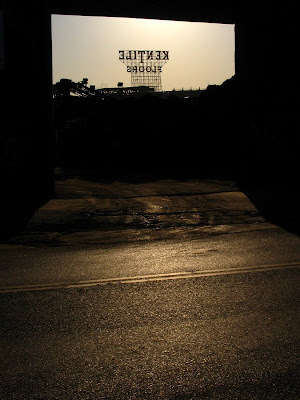 As last decade's real estate boom collapsed in 2008, the Brooklyn Daily Eagle reported that The "Gowanus Village property is back on the market.... the asking price is $27 million." 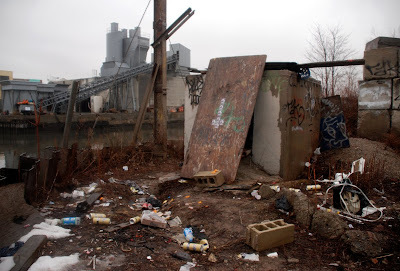 By 2009, the NY Times had concluded that "New York is, after all, a city where people have proved themselves willing to live almost anywhere, where no location, be it smelly or notorious... seems to be beyond the reach of gentrification. 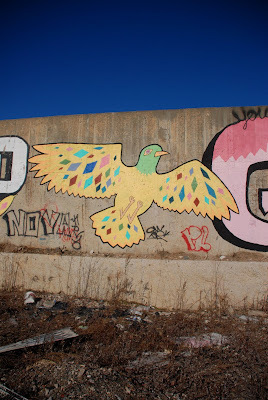 But the case of the Gowanus Canal has put that assumption to an extreme test.... the Gowanus Canal has been left to wait on the verge of metamorphosis, no longer one thing but not yet another." 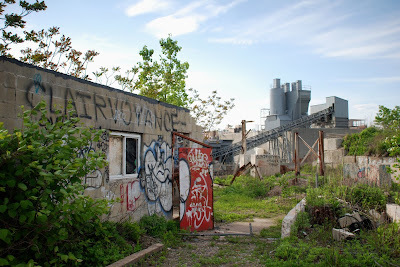 To date, no one has stepped forward to buy The Gowanus Village property. The land remains abandoned. The Batcave is now being offered for sale by realtor Massey Knakal, which writes simply "Make an Offer." 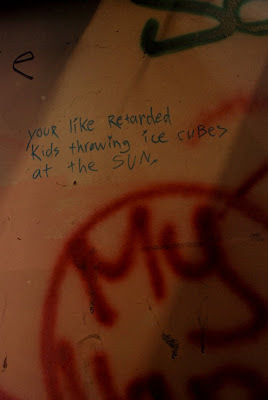 For additional photos from this expedition, see Bluejake. The story of the Whole Foods lot is one of the best examples of how New York City's recent real estate boom and subsequent collapse unfolded. 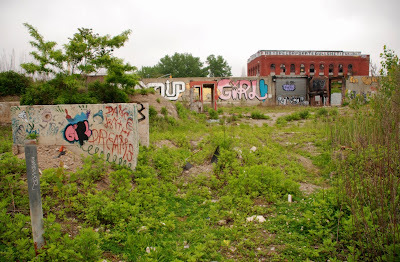 Located at the intersection of 3rd Avenue and 3rd Street, this empty lot is bordered on two sides by the Gowanus Canal. 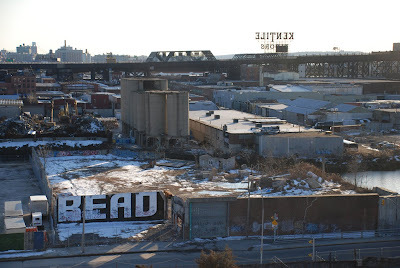 In 2006, it housed an active scrapyard, but this closed when ground was broken for a planned 68,000 square Whole Foods Market, which promised "Brooklyn residents a wide array of natural and organic foods" alongside a public esplanade and community center. The idea of building this market on the banks of a toxic industrial canal struck some local residents as a far-fetched idea, but this was representative of the ambitious yet ill-conceived development projects that were common during the past decade. Soon after the groundbreaking ceremony, construction came to a halt. 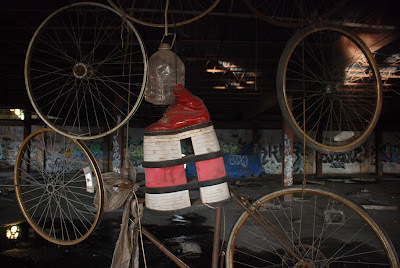 Leaking "550 gallon oil drums" were discovered underneath the planned construction site, remnants from the lot's "former life as a petroleum refinery," according to the NY Daily News, "demolishing the company's forecast for a store opening" in 2006. Today, after 4 years of delays, cleanup crews have finally moved in to fulfill Whole Foods' promise to detoxify the property, although the future of their store remains uncertain. The discovery of pollutants wasn't much of a surprise. 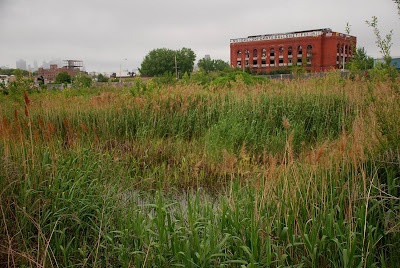 The Gowanus area is a well known toxic brownfield, and may soon be declared a national Superfund site. 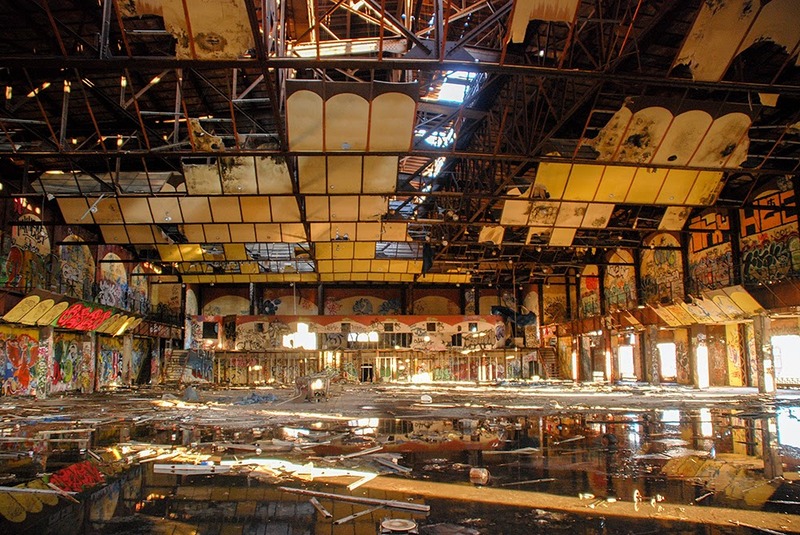 In 2007, Science Line reported that "more than a century of industrial misuse, indifferent government oversight, and public apathy have taken their toll. In addition to the garbage and chemical contamination, the canal is a dumping ground for raw sewage.... contaminants such as sulfur, cyanide, asbestos, PCBs, mercury and volatile organic compounds are in and along the canal." This report also revealed that the canal's water was infected with gonorrhea. 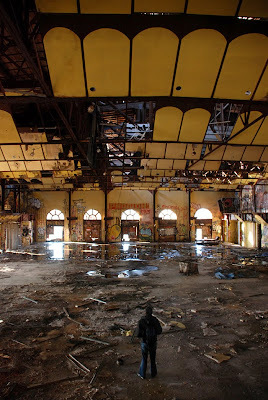 Whole Foods was aware of the area's industrial history, and had planned from the beginning to work with the Department of Environmental Conservation to clean their brownfield. The industrial history of this specific block can be traced back more then 125 years, to when it was the "five-acre factory complex" of the New York and Long Island Coignet Stone Company, according to the NYC Landmarks Preservation Commission. Only one building from the Coignet complex has survived over the decades - a "pioneering example of concrete construction in the United States" that stands at the corner of 3rd Street and 3rd Avenue. Commonly known as the Coignet Stone Building, this landmarked structure dates back to 1872. Today, it is the only building on the block. Though reportedly not owned by Whole Foods, its fortunes have been closely tied to the fate of their store. By 2007, Whole Foods had begun to neglect their property and delay their opening date. 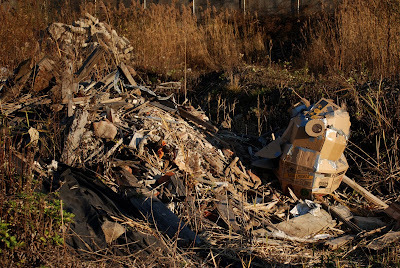 Perhaps they had discovered, as the NY Sun wrote, that "cleanup costs are sky-high... much of Gowanus's ground is so contaminated it simply cannot be adequately cleaned up, at any cost." 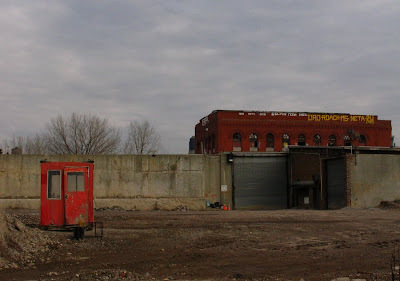 By November 2007, the fence around the lot had "been down for several weeks, angering neighbors" and leaving the site "wide open," according to the NY Daily News. 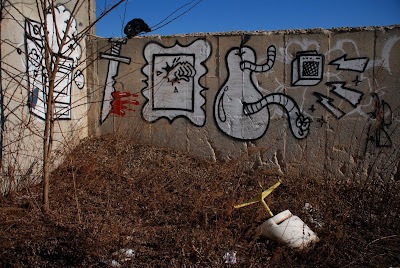 Graffiti artists quickly moved in, turning empty walls into canvases for huge murals. 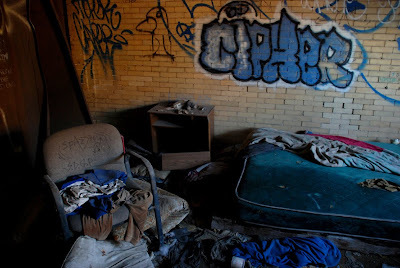 Homeless squatters took over the remaining buildings, including the Coignet landmark, although a local businessman reported "evicting the bums and the rats living there" in 2007, according to The Brooklyn Rail. In 2008, the NY Times declared that New York's real estate boom had come to an end. Enthusiasm for the delayed Whole Foods Market began to wane. The NY Sun pondered the wisdom of "opening a store on a toxic floodplain" while Gowanus Lounge grumbled "for the record, it’s been nearly two years since the official “groundbreaking” at the site. Never take those “groundbreakings” to the bank, friends." 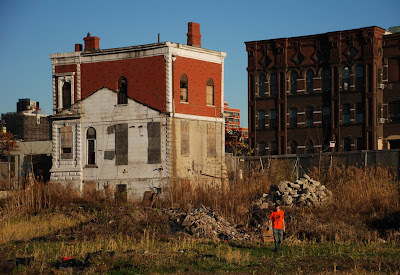 Brownstoner, meanwhile, reported that the Coignet landmark building was "crumbling" and that "between the barren Whole Foods site and the dilapidated landmark, the corner of 3rd and 3rd currently tells a sorry story about both the past and future of Gowanus." 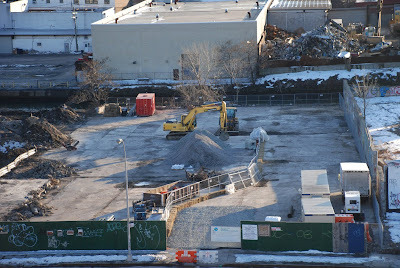 Like similar development projects throughout the city, the Brooklyn Whole Foods project appeared to have stalled. 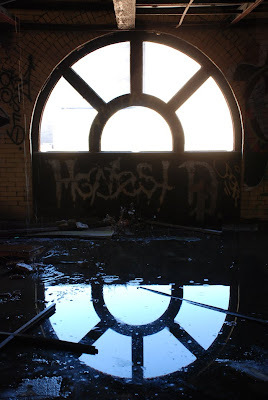 By 2009, the lot had become completely feral - a wild and marshy wetlands populated by a large group of homeless men living inside the basement of the Coignet building. The only other building on the block, an abandoned warehouse containing a large squatter shack, was burnt to the ground and demolished. A boat washed up on shore, stripped down to the decks, and soon sank. 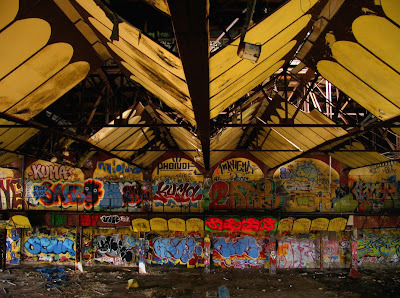 Sculptors, painters, photographers and filmmakers turned the lot into a place the Gowanus Lounge once called "Brooklyn’s biggest toxic playground." 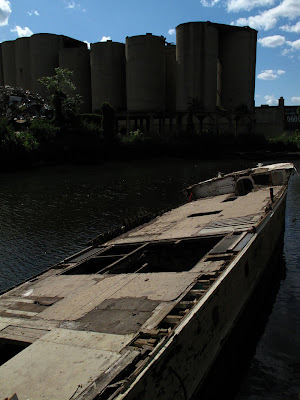 In January 2010, the NY Daily News reported that Whole Foods "company officials concede they have no clue if they'll ever build a store along the polluted waterway... the company is vowing to clean up the mess, but may never build a store." Today, the lot is busy with trailers, backhoes and new fences. Members of a cleanup crew say that work began last week and estimate they will be finished with the lot in about 6 weeks time, by mid-April. "There is not much to clean up here," said one member of the cleanup crew. Just "piles of dirt" and a "few old gas tanks." When they are finished, a portion of the empty lot will be transformed. And it will remain empty. The Whole Foods project now appears to be just another of the many unrealized schemes of the Bloomberg era. Around the Gowanus, those unfinished projects also include the Gowanus Village, the Toll Brothers development and the Public Place project. 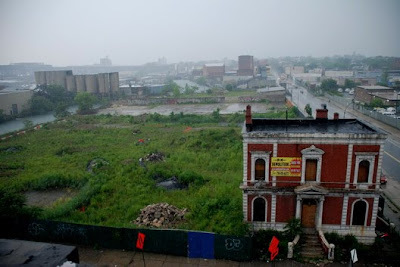 As the NY Times wrote in 2009, "the Bloomberg administration, sensing a chance for revitalization, rushed to rezone 25 blocks of the Gowanus area for nonindustrial uses, identifying more than 60 development sites with a potential to generate at least $500 million in tax revenue.... All of these projects were proposed at the height of New York’s real estate boom, and nowadays, regardless of the outcome of the Superfund controversy, some of them look very much like the products of mania."